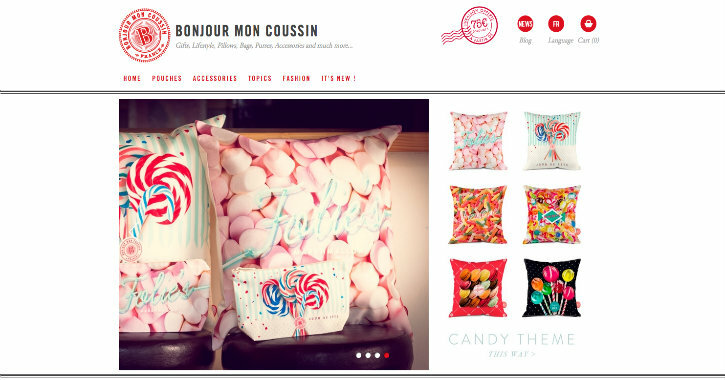 What Makes These E-commerce Website Designs Inspirational? Quality product photos – product photography is equally important to the look of an e-commerce website as the layout and graphic design. 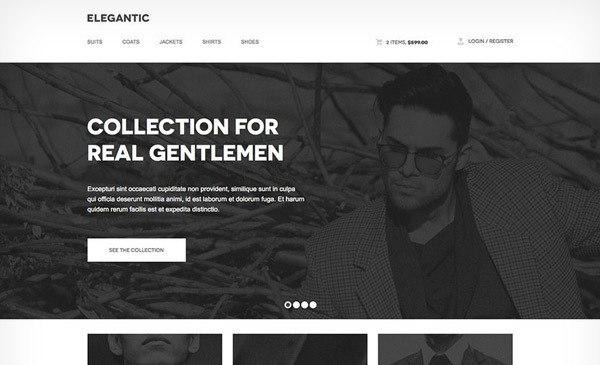 Unique, stunning layout – showcasing the products effectively will bring better results in conversions as well as original touches like beautiful graphics, textures, fonts, etc. Easy navigation – products should be well-organized with categories, if the inventory is large enough, and an effective search feature helps customers find exactly what they need using search terms. 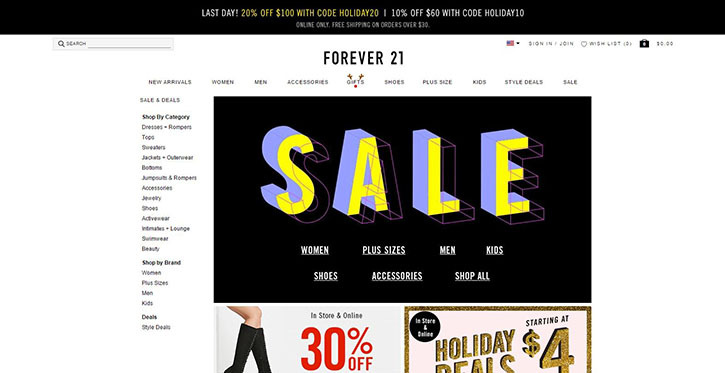 Promotional messages – an e-commerce site with promotions and deals should advertise them front and center, such as in the homepage slider or in the header. A pop-up sign up form for newsletters can also help with conversions. The e-commerce industry has become more competitive and challenging for the new-comers. So, designers, investors, and buyers are always looking for some sort of inspiration. A great e-commerce website is sleek, user-friendly, users are able to jump from one category to the other quickly, equipped with tons of useful options, each product and category has a valid description. Nearly all of the e-commerce stores have similar designs and most of them are focused on a single particular niche. One of the first ways to improve the usability of a retail web design is with the nature of the product photos. Of course, high-quality photos are a given. But what about interactive features such as 360-degree views and image zoom that really put the user in charge? In addition to the interaction aspect, these user-controlled views also help a shopper feel more confident in what they are buying. After all, in a store, they can pick up the item and feel it in their hands. 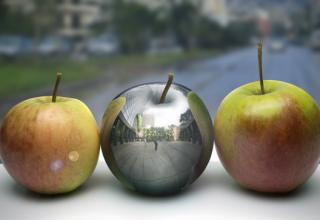 Providing images of every side of the product as well as a close-up view helps to provide a more tangible experience. Customers can view the product up close and personal. 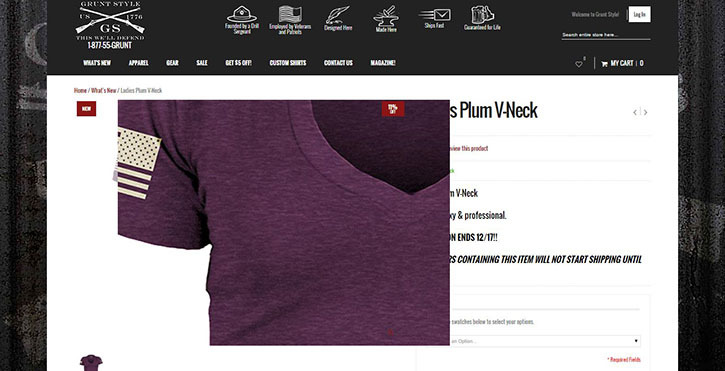 Even with straightforward products, such as the t-shirts on the Grunt Style website, a zoom option improves trust in the quality of the items. On this site, customers can zoom in on every aspect to inspect it as they would in a store. The second aspect, luxury items, has to do with what products you sell. Now, not every item that you sell may be considered luxuries, but you need to offer enough to entice online shoppers to choose your site rather than a competitor’s…and make them feel like you care about making them happy. Provide a new and interesting human experience that they could not have unless they go online to your website. Luxury items could be anything from items you can’t find unless you travel the world to pre-release or online-only sales. 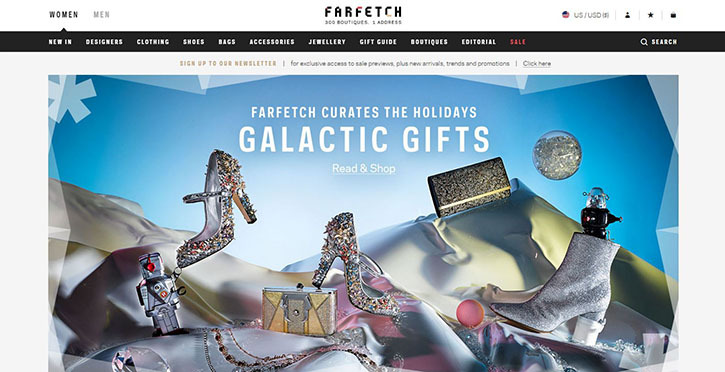 Unique items, name brands offered at a discount to die for, or anything else that adds that touch of value, of luxury, to your online store, will help to provide a unique experience for customers. A great example is Farfetch. This website provides items from over 300 boutiques from across the world, so it’s all quite unique. Plus, the web design itself is very appealing and provides a fresh experience for all of those shoppers tired with the same old online store look. Lots of filter buttons allow shoppers to fine-tune their search, much easier than if they were in a store! Every color, image, and piece of content on a website should evoke an emotional response from shoppers. Remember, humans, want an emotionally authentic experience online. So (just as on Bold and Noble in the section above), set the mood of your brand with a unique style and match it with your tone, which can be conversational, humorous, cheeky, or whatever will further create that emotional connection between you and your customers. And, this is a good place to remind you that you have to really know your audience to know how to create authentic emotions. 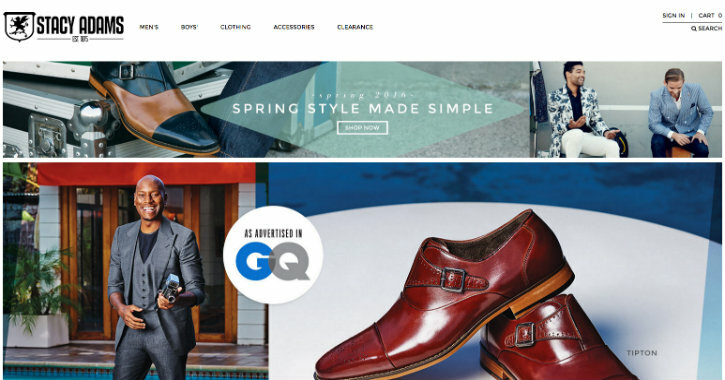 As a shoe retailer, this brand sets itself apart by using a bold tone of voice. They aren’t shy about making sure their customers know that their shoes are made by renowned craftsmen, but they also keep it short and simple and conversational. This tone of cool confidence provides its customers with a base of trust, especially with the human-like voice. And they keep the same tone of voice with every aspect of the site: feedback, suggestions, explanations, and more. The “try before you buy” feature is growing in popularity lately, especially in the clothes and accessories venues. After all, one of the benefits of shopping for fashion items in stores is that customers can try the items on before buying. Online fashion stores are finding that providing a “try before you buy” offer makes them much more competitive with brick and mortar stores. This offer allows online stores to provide that tangible, human connection that is often missing in online clothes and accessories shopping. Bungalow Clothing is one such store that gives customers five days to try the high fashion clothes for free before returning them. This company plays it smart, too, by including prepaid envelopes and having no membership fees nor styling fees. The personalized styling profile really takes this “curated dressing room” feature beyond a simple try before you buy user experience. Customers can truly have a unique shopping experience without leaving the comfort of home, and one that can’t be found elsewhere. A seamless experience between web, mobile, and store makes customers feel confident in a brand, no matter where they make the purchase. Customers’ trust of a retailer is wrapped up in the brand look – if they see that same look online as they do in the physical store, they will trust the online experience just as they trust the brick and mortar experience. If your brand is one that wants to provide that same human experience across every media and location, then make sure to look the part. 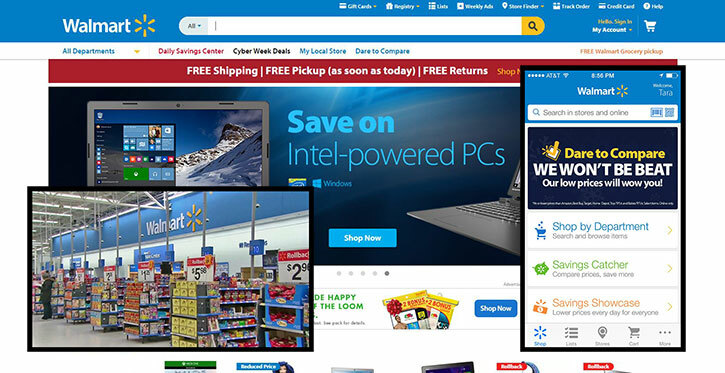 Walmart.com is one that definitely does this right using the same colors, fonts, organized design, messages, and tone from storefront to websites to mobile apps. What I love about the Walmart app are all of the possibilities for fine-tuning the experience to my own preferences, so that I can shop on mobile, the website, or in the store exactly how I want. 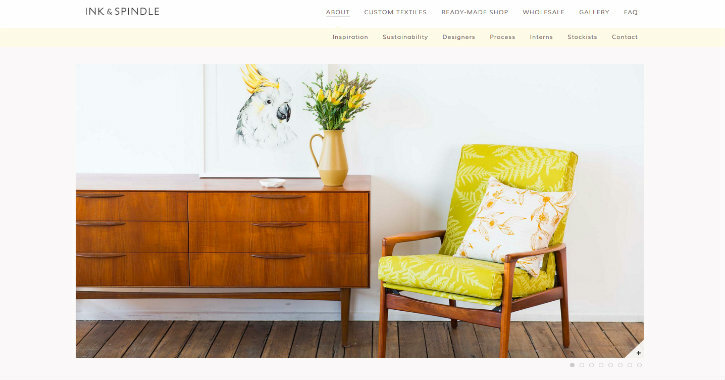 Making your site easy to shop is a vital aspect to gaining those needed conversions – and this is an integral part of creating a positive user experience. Think about this: when customers go to a store, they can ask clerks questions or pay by simply walking up to the checkout counter. But the downside to a storefront is that a clerk may not be available or checking out takes too long on a busy day. So, offer a convenient shopping experience online to mimic a physical store experience on its best day. How do you do this? With simple organization including filters, an easy checkout, visible contact information or Live Chat, quick and free shipping, painless returns with a money back or store credit guarantee – or anything else that improves usability and makes online shopping a positive experience. The Forever 21 website provides the excellent organization with categories broken down. What always draws me back to the website is that they include a category for their clothes on sale. For those shoppers like me who go straight to the sale rack upon entering a store, an online store that provides a discount or sale category is one that provides one of the experiences most important to me in a physical storefront. Plus, customers get their actual money back, not in-store credit, when making returns, another big bonus for many customers. One of the best ways to provide a powerful human experience through online retail shopping is to include a social feed that creates a bandwagon effect. Everyone is talking about your online store, so it must be great – an experience that we just can’t miss! Those sponsored Facebook ads, sponsored Tweets, promoted Pinterest pins, and even the YouTube video ads are all an important part of making a connection with customers, promoting expression, and providing that human experience. 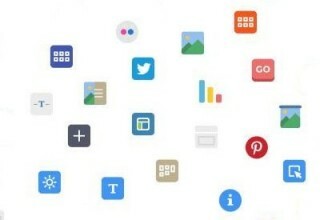 Making that connection between the website and social media can be further enhanced with some simple design tweaks. The Eden website places social media icons in the header of their website for easy access. This not only gives customers more than one option for staying in touch but also reinforces the legitimacy of the brand in the mind of new customers. It’s quite the odd concept, especially for realists: a human experience occurring within cyberspace. However, although it’s not necessarily a flesh and blood thing, digital experiences have become a huge part of most lives today. And providing this human experience digitally is a very important part of the success of a retail website. A positive, impactful user experience plays a major role in returning customers and future purchases. So make sure that your web design gives customers this human connection and even puts the consumer in charge of their own experience. 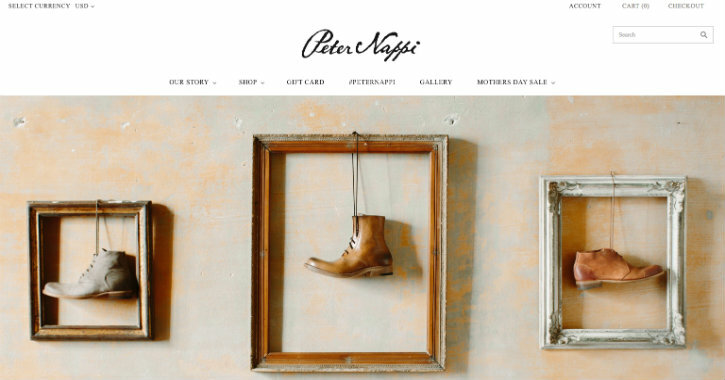 Go beyond basic usability rules and provide the human experience that online shoppers crave. Now let’s get to some great examples! 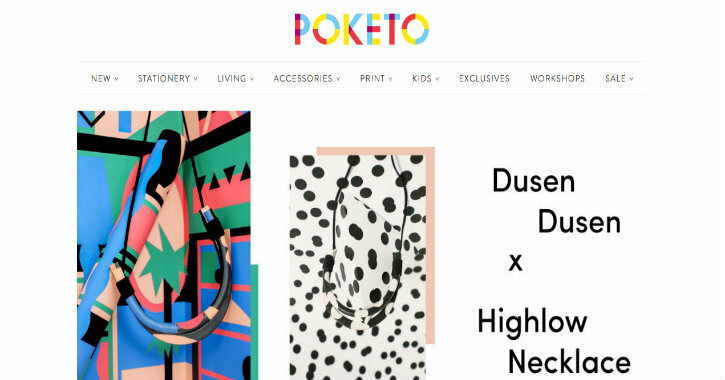 In this post, we’ll showcase 32 awesome e-commerce sites to inspire your next design. Hopefully, this selection will provide you with some inspiration that can be put to good use in your own work. First of all, the layout is simple yet stunning with gorgeous photos of clothes and accessories on models. The design is unique with thin fonts and retro/vintage illustrations and boxes. The navigation is clean, and the header includes their current specials and deals without distracting from the new products showcased on the homepage. Plus, their pop-up newsletter offer is in the same style as the rest of the site. The pop-up full-screen newsletter offer and includes a discount when customers sign up – in bold, catching colors. 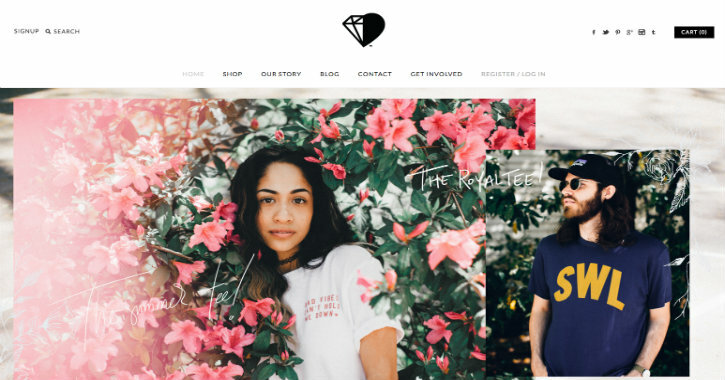 This t-shirt website uses a tight grid layout with product photos in boxes, giving it an almost blog-like look, and promotions are in the featured boxes. Their t-shirt inventory is extensive but organized very well with categories and sub-categories, along with a highly functional search feature. Even though it’s a free template, the design is sleek and stylish to showcase high-end products. Fully optimized for mobile devices with 2x retina images. 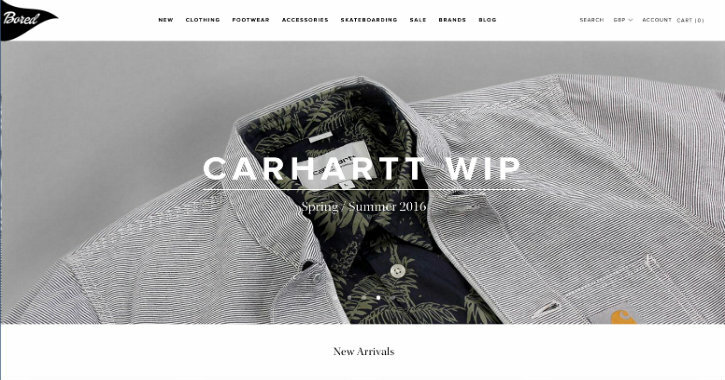 Clean simple layout with strong emphasis on the products and adding to cart. This shoe store allows customers to search by type of shoe or accessory or even by brand and sale items. Plus it includes an excellent search feature. 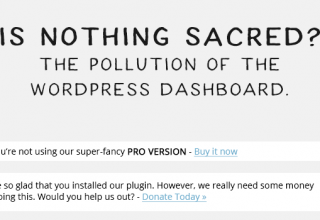 The homepage slider is in stunning full-width with their specials in the header just above. The nicely textured background adds a nice visual appeal to the simple and clean layouts on each page. This simple design comes with a large, full-width slider, which includes eye-catching photos of their products in use. The inventory is quite large but well-organized with lots of categories and sub-categories, “search by” filters, and more. 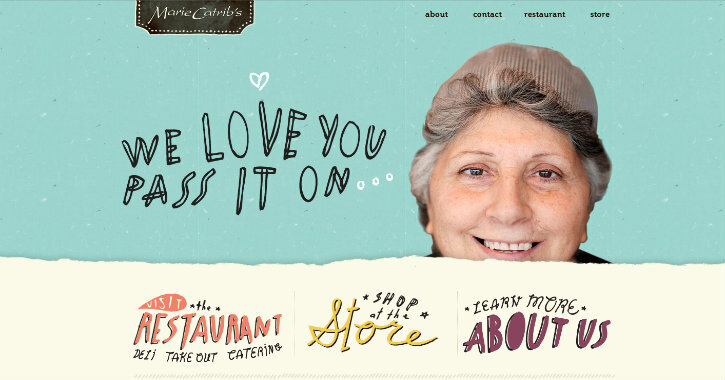 The icons are a gorgeous touch on this website, plus the fonts are quite eye-catching as well. While the “home” link is actually to their bedding accessories and decor, the rest of the menu is laid out well, and every page includes high-quality photos of their products. With fonts and a background that caters to the western-styled name, this hilarious t-shirt company portrays a memorable look but keeps the focus on its t-shirt designs. 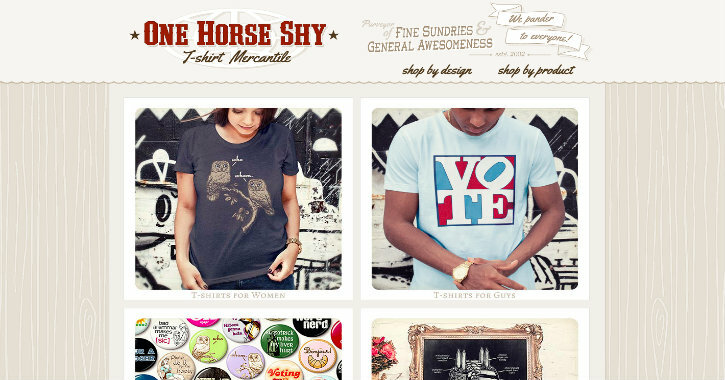 All t-shirt designs are on the homepage laid out in 4-column boxes so that viewers can quickly and easily browse through the designs without getting distracted. 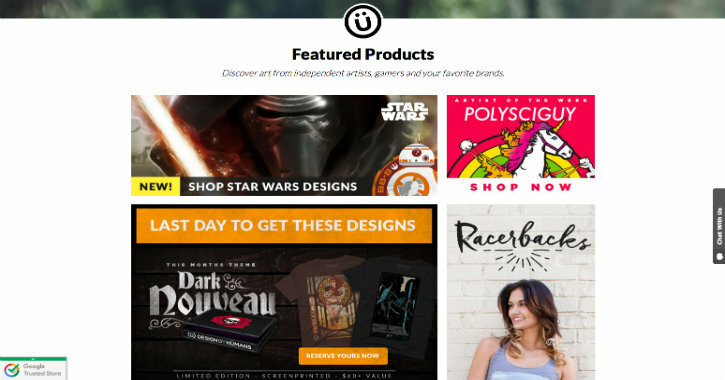 The bold fonts, colors, and layout along with unique icons adds lots of energy to this e-commerce site. The inventory is organized by type, gender, or even brand and includes other filters, plus a search box for entering keywords. The header includes their promotions in eye-catching, bold display. The beautiful, large, full-width slider on the homepage includes high-quality photos of the products in use on models, and the rest of the design is quite simple, which puts the focus on this slider display. The fonts are very unique yet don’t distract from the products. Clicking on any category leads to a well-organized display page that includes the ability to filter by the color of the bags. 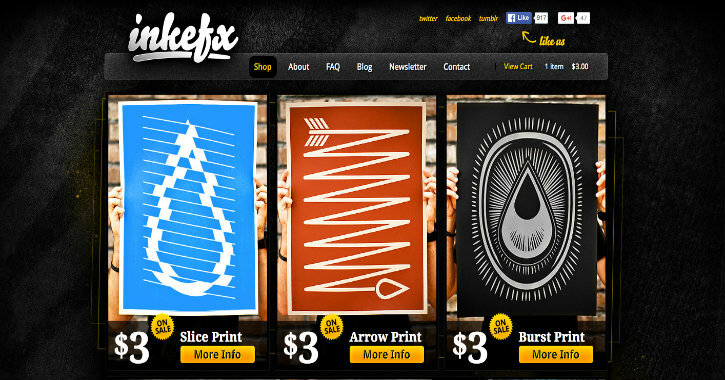 The dark, grunge background fits the style of t-shirts for sale on this e-commerce website very well. Plus, their fonts are large and buttons brightly colored, which makes it easy to navigate through items on the homepage. 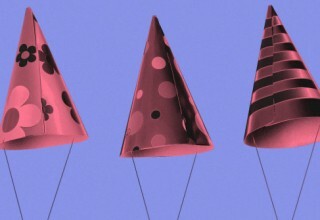 A large banner in the header includes promotional offers and discounts. The minimal layout and light colors give this website a very clean, breezy look and feel. 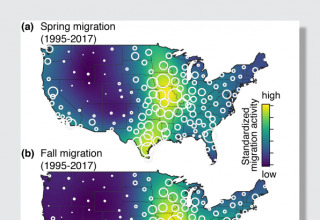 The fonts on this site are also very airy in design. A boxed layout with stunning photos of items makes for easy browsing, and the way the colored boxes match the colors of the attached image is very impressive. 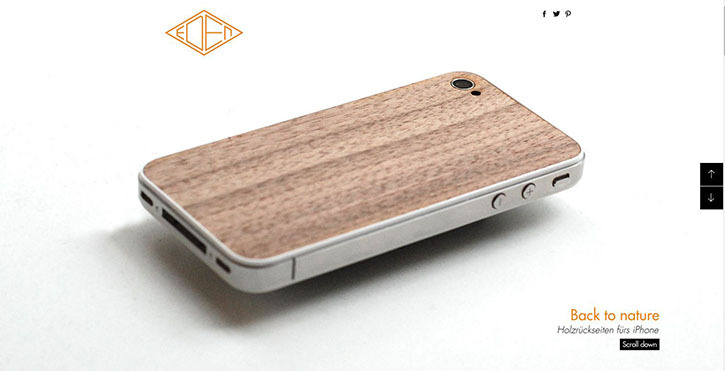 Large, high-quality images make products look that much more appealing. 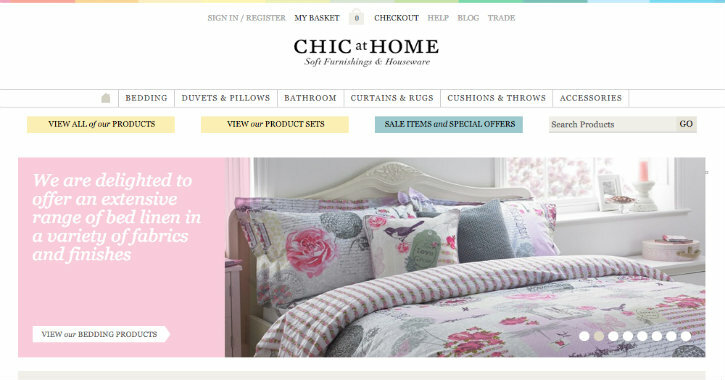 Features on the homepage give customers a place to start. 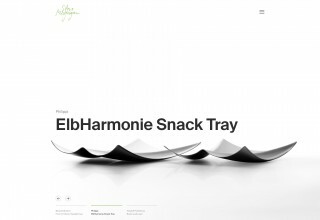 The design is really sleek and it could be the perfect choice for the wholesalers. Gorgeous fonts and stunning photos compliment the minimal design of this sustainable, custom-made textiles shop. The long scrolling homepage tells the story of the company in a novel fashion, using visually stimulating animations to slide photos and text onto the page while scrolling. Two navigation menus at the top are a bit confusing at first. 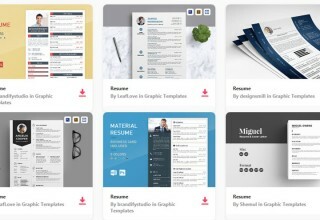 The top menu leads customers to other pages, and the second menu allows viewers to jump to different sections on the home page, rather than scrolling the entire way. 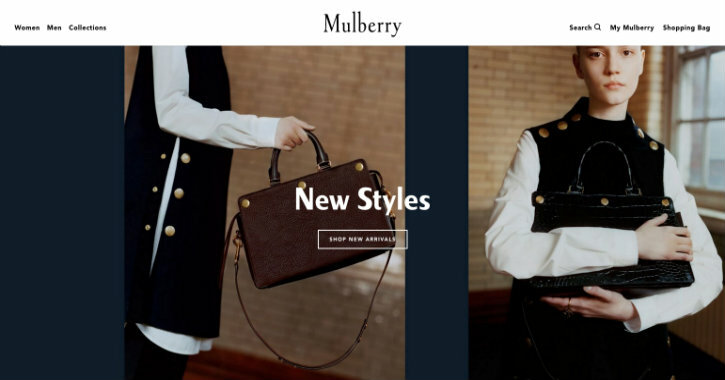 With a very simple layout, this website design places all the focus on the product images, which are very artistic and easily draw customers into the unique experience of Mulberry. 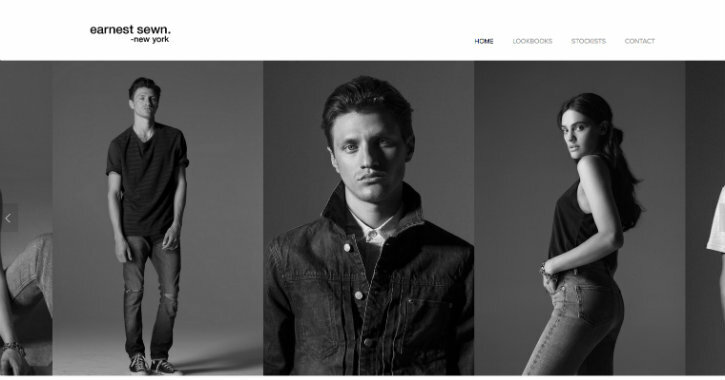 In fact, the website also includes photos from their lookbook photo shoot that visitors can browse through. This gallery and the blog, which contains articles of celebrities sporting their bags, further contributes to an intriguing experience. Every aspect of this site perfectly coincides with the refined craftsmanship of this company’s products, from the vintage fonts to the vintage icons and more. Browsing through the pages is a treat. 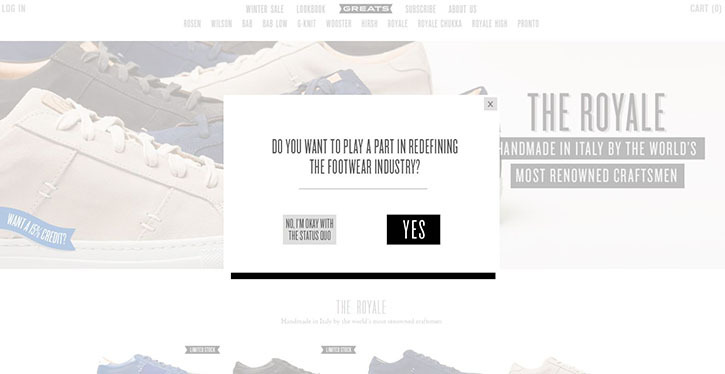 The company tells their story on a slider with navigation buttons for an engaging experience. A buying guide page comes with information customers may need, such as product care and shipping policies. The product photos on this site are incredible, with high quality, vivid images of products in outdoor scenes. The homepage slider is unique with a thin, frame-like box just inside the images on the slider, a look that goes well with the custom yet comfortable look of the brand. A video of hand dying their shoes is also included in the slider. Category pages include wide, eye-catching feature images with high-quality product photos set against the white background, standing out easily in the minimal design. The bright header advertising shipping orders immediately catch the eye, along with the colorful title. The white background is an excellent choice for this site since all of the products include bright colors. A Quick Shop button appears when hovering over products, which allows customers to take a quick glance without the need to move back and forth between product pages and category pages. 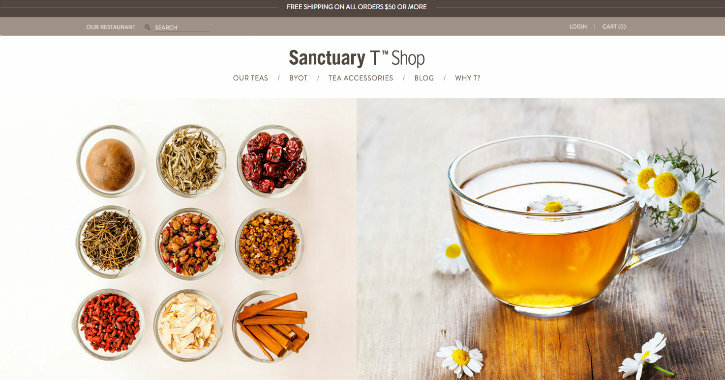 Beautiful images of teas and ingredients are found on the full-width slider and product images, making it unnecessary to include other design extras. The minimal design does include some colored text and buttons, but not much else, so the photos stand out very well. On product pages, images zoom and scroll around when customers hover over the photos, which show the different ingredients in mouth-watering, luxurious size. The retro background colors, and icons with the retro products sold on this e-commerce site. Featured item links with thumbnail images are in an unusual location – the header directly above the slider on the homepage, and the shipping special is placed directly below the featured slider. These unique touches, as well as the great design and excellent product images, make this site fun to browse. 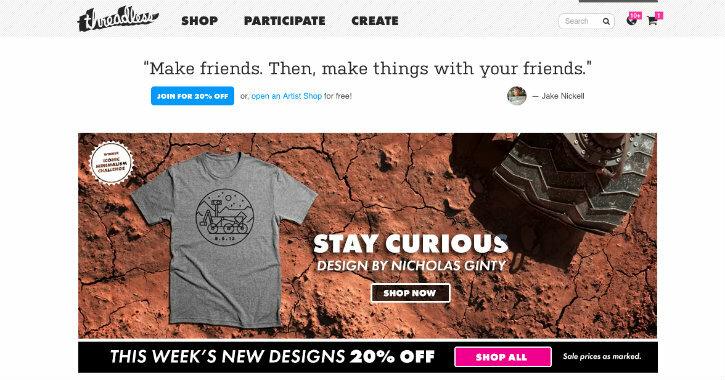 The pop-up newsletter sign up sets the stage for this site with a fun, personal tone to the copy. And this “real” tone carries over to the photos that include unconventional models (i.e. models who look like real people). This is another store that has built a strong community around their products with their blog that includes posts on love, value, and being free to be you. Customers can even submit their own story on similar topics. The homepage on this site is very simple with only a title, navigation menu, stunning photos, and minimal footer with company links. 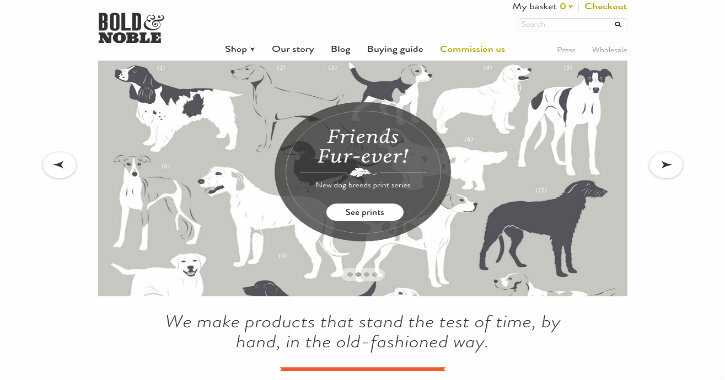 While technically not an e-commerce website, since products are only available in stores, this site does an excellent job of drawing viewers into their products. Links include their story, store locations, designers, events, mailing list sign up, and a contact us page. The full-screen background on this site is made up of several different stunning photos. Each of the images links to a featured category or collection, with more categories in the navigation menu in the header. Even category pages include a muted photo background. Another interesting feature is that every product page includes a Facebook comment widget, an excellent method for using social media to get people talking about their favorite Born products. The email submission pop-up comes with two buttons for submitting: one labeled “women” and the other labeled “men” so that customers can choose which updates they’d like to receive. The special is front and center on the simple, short homepage, encouraging customers to check out the current discount. 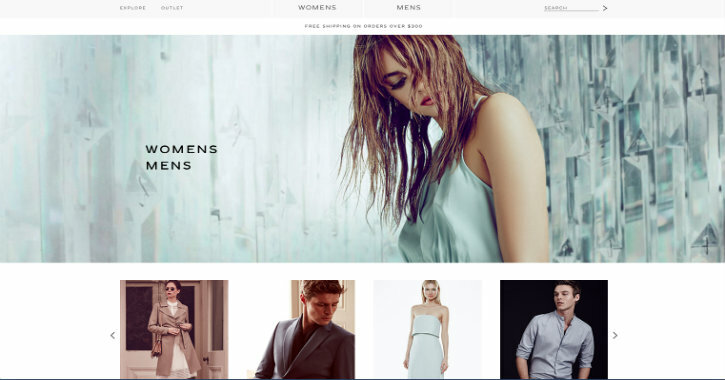 The navigation links for men or women clothing lines are mega menus complete with images. Category pages are easy to browse through with lots of filters such as size, color, and price. This site is incredibly fun and refreshingly original. 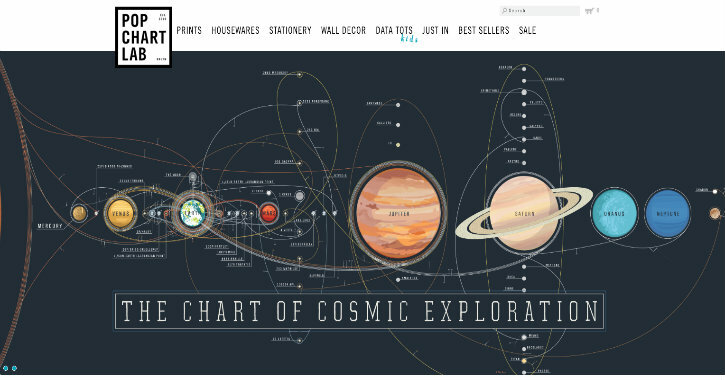 Playful, colorful fonts make clicking on links like a game. Photos of food are incorporated into the background, rather than kept within their own boxes. The homepage slider even includes a picture of Marie peeking over the torn edge of the slider. 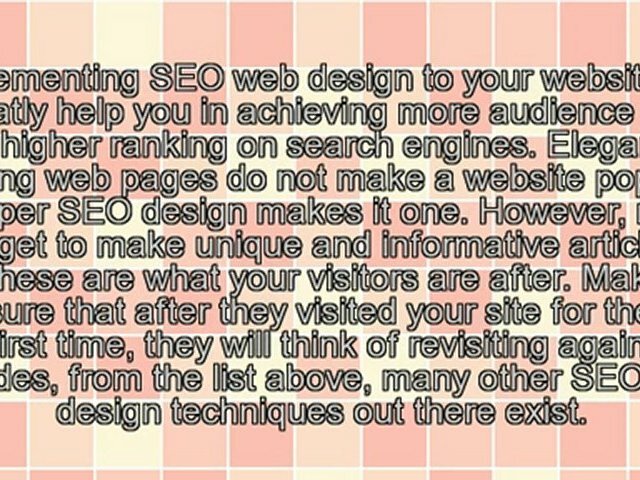 Stylish fonts and colorful design produce a great deal of interaction and the overall outlook is related to the niche. This site not only includes a pop-up email sign up form for first-time visitors but also advertises exclusive previews and specials for signing up in the corner of the homepage slider. Below the slider, which includes gorgeous product photos and sales, are image links for featured products, the social media sign up page, and their shipping special with the link leading to more details. Keeping customers updated and informed is definitely a must for this brand. 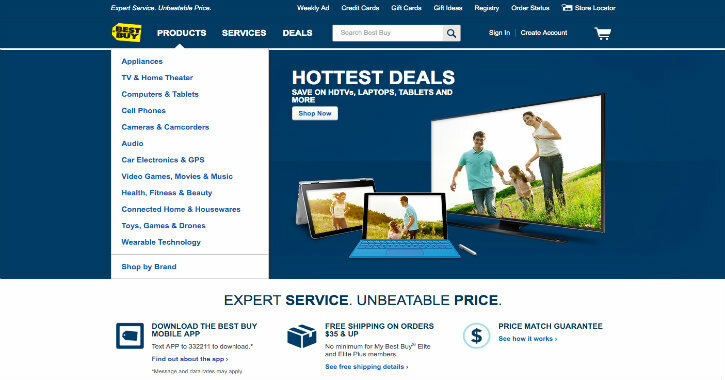 Best Buy is a great example of an e-commerce website that organizes tons of products very cleanly. With tons of information included on the homepage, they keep the most popular items in the very top of the page, such as the current sale, products trending now, the navigation menu, and valuable items like college student deals and shipping specials. The search bar allows customers to search by keyword, SKU#, or Item #. When customers click on the Products tab, general categories drop down. When a customer clicks on one of these categories, another menu pops out to the right with an image and sub-categories that leads to another page. Every product and accessory related to that category is accessible from more links on the page.